The Ojibwe language is in danger of becoming extinct as more and more Ojibwe Elder speakers pass away. This program creates a wider understanding and knowledge of this beautiful language. 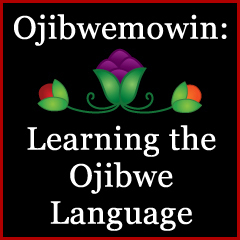 It is our goal to teach Minnesotans the origins and meanings of the Ojibwe words with hopes they will start using the language again and interweaving it back into the Ojibwe culture. Our hosts, Darrell Kingbird or Adrian Liberty starts us out with conversational pieces that we can use in our everyday lives. Please note: the Ojibwe language has many dialects with several dialects associated with only Minnesota. Making you guys phrases with - oon. Using "we" phrases with word with vowel ending. Examining phrases using - niinawind. Examining words that begin with - giizhi. Using you all phrases with vowel ending words. Using you all phrases with words ending with - in Pos. Using you all phrases with words ending with - am. Describing different ways of wind. Describing different ways of sitting. Describing different ways of walking. Using "they" phrases with words ending with vowels. Using "they" phrases with words ending with - oon. Using "they" phrases with words ending with - an. Using "they" phrases with words ending with - am. Using "they" phrases with words ending with - in. Phrase for addressing one child. How to address more then one child.